Sometimes a pretty color is all you need to make your jewelry shine. I don’t mean harsh bling (though that can be totally fun) – I mean a pretty, soft, seductive color. Sheer colors are looking wonderful to me these days. The color really is the star of the show. It’s a little quieter, and it just feels classy, you know what I mean? 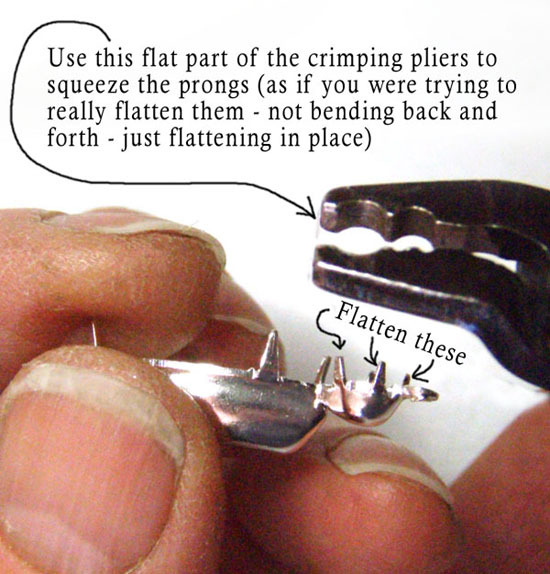 Plus: pretty, affordable, easy to use. 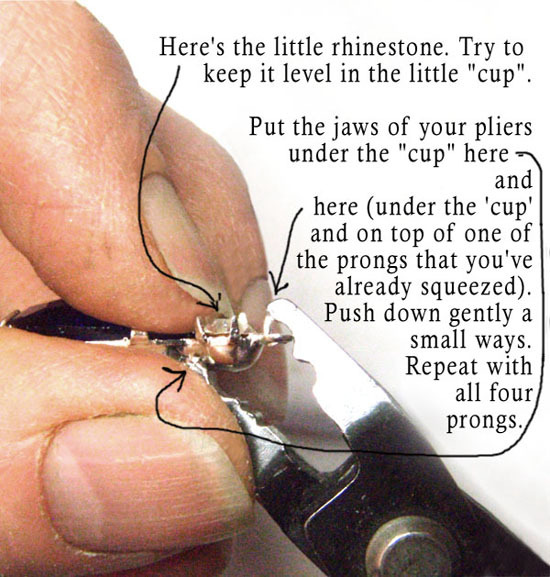 All the usual reasons that DIY glass jewels are a good way to go. Plus Christmas and the holidays are on the way. I’m just saying. 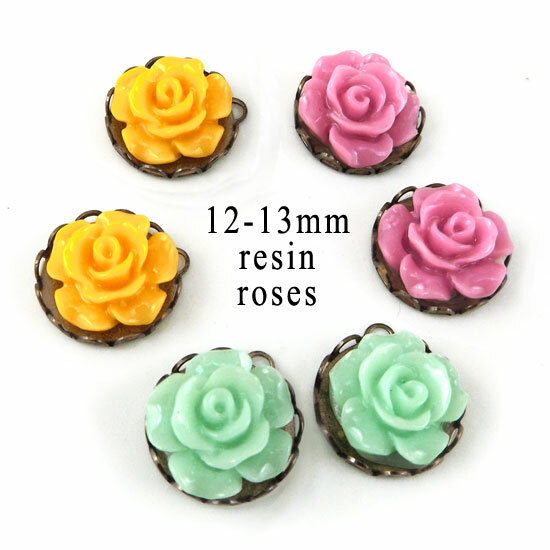 These 13mm (1/2″) resin roses aren/t precious – they’re just pretty 🙂 And they combine beautifully with antiqued brass, with filigrees, with glass. I’ve purchased a few and I’m going to be trying out a few ideas. When in doubt, go for red. I’m serious. A simple teardrop pendant. 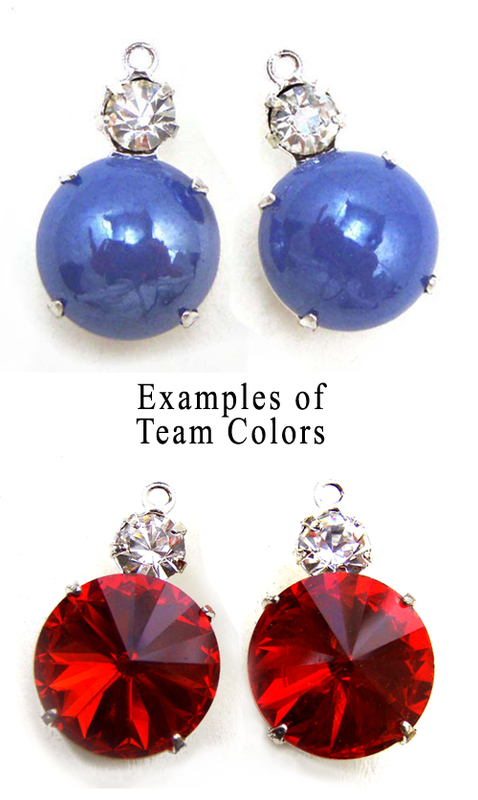 Sparkling ruby red earring jewels. A gold bracelet with one dramatic red octagon. You see what I mean? It’s always girly, it looks great, it’s wearable for just about everybody. You don’t have to get complicated. And if you want to get richer and more dramatic – add more color to the red. A hand-linked “chain” of blue agate rounds and green rivoli drops. Deep purple glass rondelles, golden spacers, and red, green and blue clusters. Use your imagination – a surprising number of colors not only go with red – they look fabulous. When in doubt, go for red. Seriously! The surprise of a more golden “smoky topaz” – I got these recently and was just charmed at their pretty color. 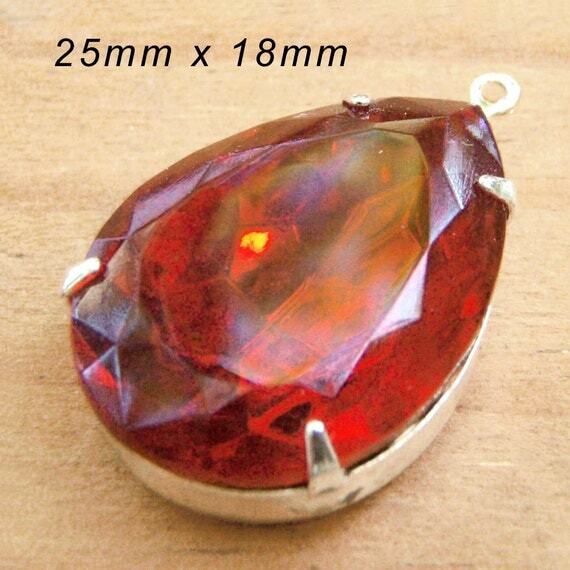 Most smoky topaz is a deep – well, smoky – brown, which is a fine rich fall color. Then there’s golden topaz, which is usually golden (yeah, duh, I know), it’s the November birthstone, and has a nice sparkle. 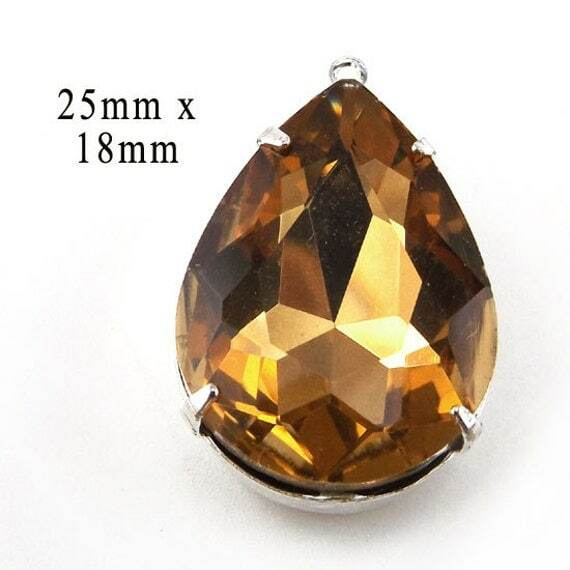 These “golden smoky topaz” are a meld of the two colors – deeper than golden, and with just a lovely rich tone. You see what I mean? Just a bit brigher, and cheerier, and well, sparklier. Would love to know what you think of this “new” color! 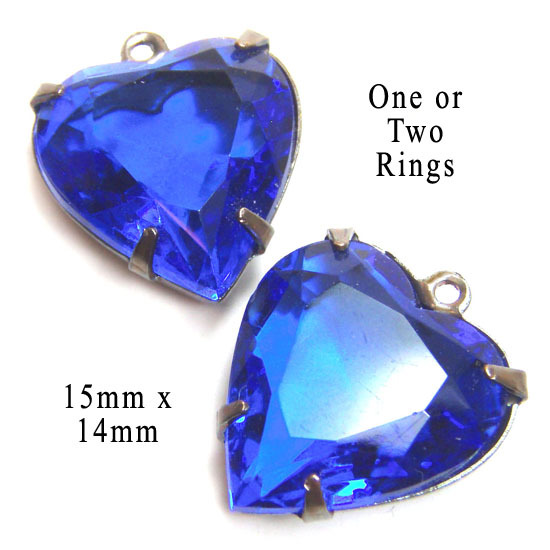 Just thought I’d highlight some Royal Blue glass jewels. Not that they made me think of the Kansas City Royals, the day after that exciting ALDS win – with that 8th inning home run that is just what baseball excitement is all about! Yeah, I’m not thinking about that. Well – not much. I don’t usually make a big deal out of organized sports, it’s not my thing. But these guys are right in my back yard, and they’ve been so terrific – and they’re a bunch of pretty good guys, I hear. So, yay Royals! I’ve got olivine, and a pretty pine green, a bit different than “leaf”, and sheer peridot, and… check back for more! 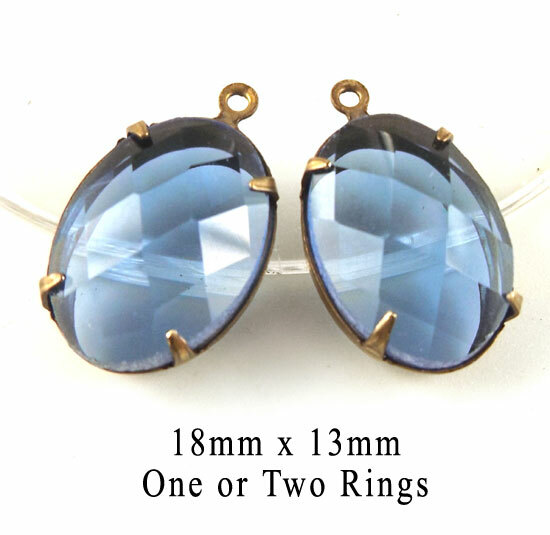 And as long as I’m thinking about navy blue – I’ve gotten some more lovely, sparkling montana sapphire glass jewels in my Etsy shop. 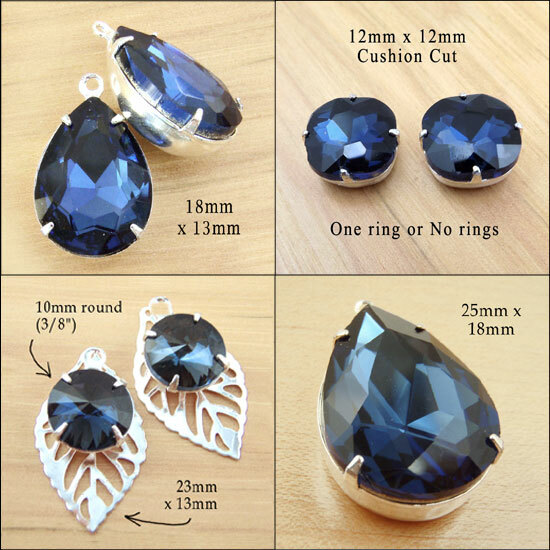 In the jewelry-making world, “Montana Sapphire” is a trade name for navy blue. And it is the hottest color going right now. Looks great for Fall, looks great for holidays and New Year’s, looks great for weddings. Kinda getting the idea this beautiful, rich color looks great? Yes – this is a win! Just as a little experiment, I’m offering a coupon code over on my Facebook page. Search the page for Coupon Code, or look for the October 10 listing. I’m doing a little SEO test. And hey, it’s good for 10% off… so that’s a bit of motivation, at least!